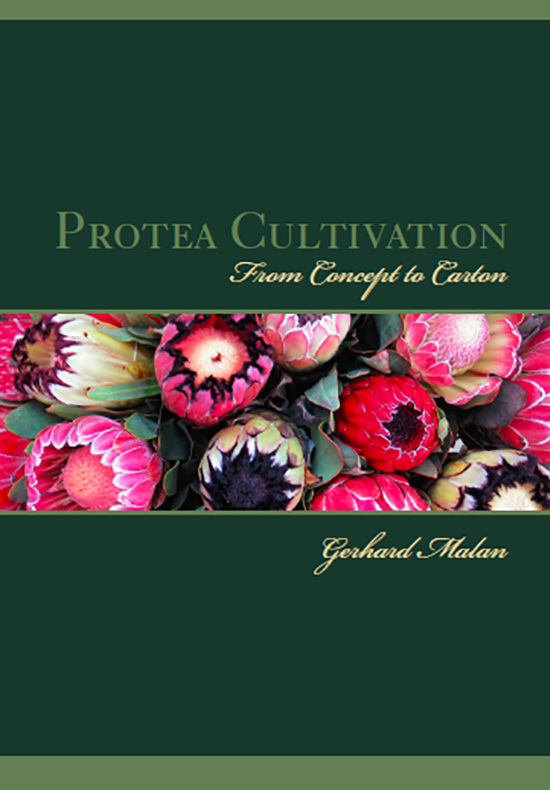 This well-researched and revealing guide to the commercialisation of proteas and greens from the Cape Floral Kingdom is a well-nigh exhaustive and fascinating reflection on the troubles involved in giving simultaneous multiple birth to turned, feet first, babies, in seed trading, gardening/landscaping, dry and fresh flower and foliage industries. With not only the babies, but their bodily parts themselves also being obnoxious (difficult to cultivate, transport, and full of pests), yet held in high esteem, due to being of royal blood. They are the dominant, prettiest, and most visible partners in the smallest, most threatened biome in the world. The flowers of plants in the Fynbos have always been available (from nature), with the markets, too, always having wanted them – Maryke’s early history extracted from Walther’s library clearly demonstrates such – albeit that the availability was the easy, fun part – basically amounting to the fertilising of the egg. As the title of the work Proteas – The birth of a worldwide industry states, the story that is unfolded herein is mainly about the protracted birth and, finally, the revolt of the youngest sibling. philanthropic roles that they played, while regarding Walther as midwife, which is a role that she herself later was elected to assume, and which she accomplished with great aplomb and commitment. the world, as well as illustrating the commitment and leadership skills that are required from many of those who are involved. Of special interest is that the country of origin was constantly being accused of being the weakest link in the production chain, with wonderful successes being reported back by travelers from all over the world. 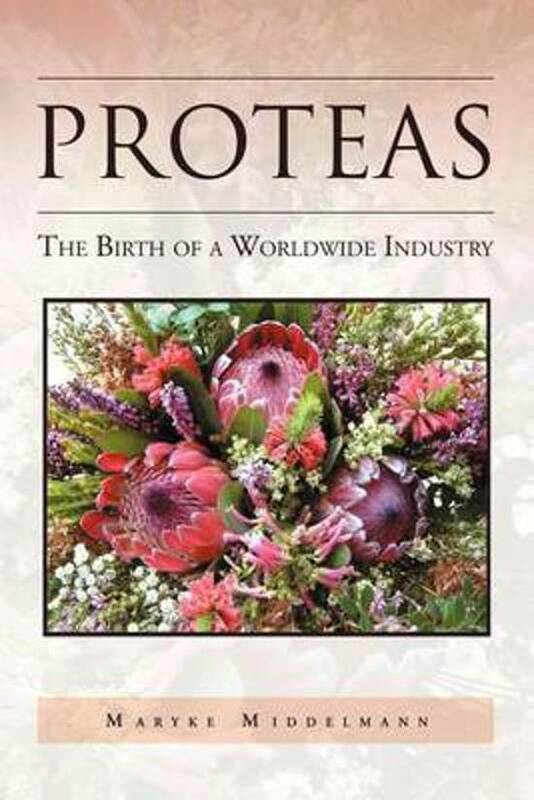 Fortunately, the country concerned turned out to be the leading producer of quality plantation-produced protea flowers in the world, which was largely made possible through usage of the information that was accumulated during the production process initiated by the audacious pioneers. Maryke’s role was, unfortunately, completed before the process came to fruition, due to one of the teenagers wishing to leave home. As a consolation to Maryke, it does seem that he/she is more reliant on his older siblings than he thought, and is currently courting them vigorously. Well done, Maryke, I thoroughly enjoyed the inspiring and informative read. cultivation chapters, a whole section is dedicated to the harvesting and post-harvest care of the flowers. Attention is also given to important practical aspects that need to be addressed to ensure a long vase life. The various diseases and pests that may occur and their control are discussed in depth. Very good colour illustrations are included which will allow the producers to diagnose the problems easier. The final chapter of the book is a compilation of the key cultivation factors (including colour plates) on the major varieties grown and marketed. These cultivation factors include soil requirements, growth rates, diseases and vase life expectations; a very nice quick reference guide. The book ends with a set of four Appendices for soil, water and leaf analysis; Agrochemicals; packaging rates and harvesting stage; and then a handy section containing the contact details of supporting organisations. The final Appendix contains selected scientific references. One area where the book is lacking is with regard to in-depth information on the wild harvesting and drying of fynbos products. Proteaceae spp. should read this book to gain insight into the industry and the phenology, cultivation and marketing of these unique and indigenous floricultural species. trials and applicable to modern day scientific farming. In relation to other crops such as fruit or vines the fynbos industry has limited knowledge resources which are often difficult to access, making this all-in-one guide a very unique and valuable resource to the South African fynbos industry. Even producers and extension officers in other countries with different climatic and soil conditions will find this guide very useful in explaining the rationale behind many of the principles used in fynbos farming. Copyright © 2019 Cape Flora. All rights reserved.